NASA has always pushed boundaries in big science and big technology. 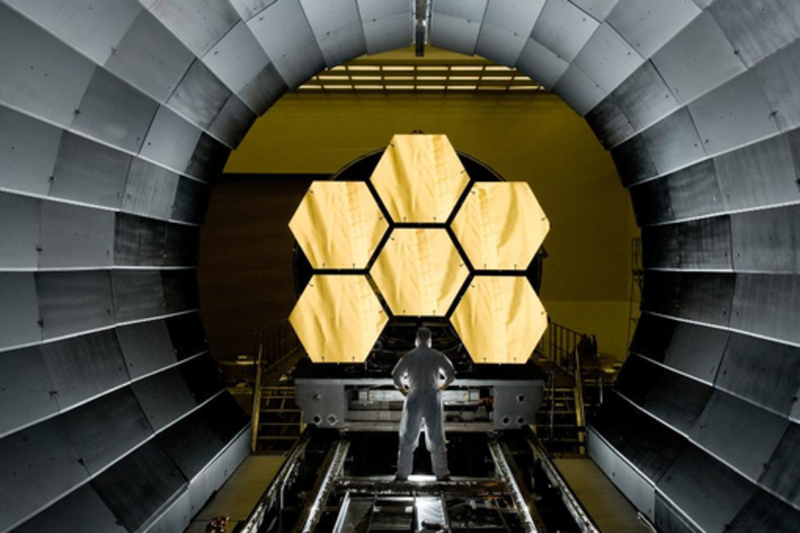 Right now, NASA (partnering with the European Space Agency and the Canadian Space Agency) is building, assembling, and testing the largest telescope to ever be launched into space: the James Webb Space Telescope. As the scientific successor to the beloved Hubble Space Telescope, JWST will explore uncharted territories in the first epoch of galaxy formation--a part of our Universe never seen before. JWST will also have the amazing capability to study exoplanet atmospheres in unprecedented detail. This is possible due to innovative technologies that push the boundaries of what is capable for spacecraft. Dr. Amber Straughn is an Astrophysicist at NASA's Goddard Space Flight Center in Greenbelt, MD and serves as the Deputy Project Scientist for James Webb Space Telescope Science Communications. Amber grew up in the small farming town of Bee Branch, Arkansas where her fascination with astronomy began under beautifully dark, rural skies. She obtained her B.S. in Physics at the University of Arkansas in Fayetteville in 2002, and completed her M.S. and Ph.D. in Physics at Arizona State University in 2008. Amber has been involved in NASA programs since her undergrad years, beginning with flying an experiment on NASA’s microgravity KC-135 plane (the “vomit comet”) in 2001. Amber’s research focuses on interacting and star-forming galaxies in the context of galaxy assembly, where she uses imaging and infrared spectroscopic data mostly from the Hubble Space Telescope. Her broad research interests include galaxy formation and evolution, galaxy mergers and interactions, physical processes induced by galaxy interactions including star formation and black hole growth, and emission-line galaxies. In addition to research, Amber’s role with the James Webb Space Telescope project science team involves working with Science Communications. She has spoken at numerous schools, astronomy clubs, museums, and research societies locally in the DC area and nationwide. Amber is also interacts frequently with the media, having done numerous live television interviews, media features for NASA, and has appeared on the History Channel, Spike TV, and in the Late Night with Jimmy Fallon's "Hubble Gotchu" segment. Amber lives in Glenn Dale, MD., with her husband Matt and her two Great Danes and cat. Her love of all things air and space prompted her to become a pilot; she earned her Private Pilot's license in early 2013. She has been an active yoga practitioner for years, and teaches a volunteer yoga class weekly. Amber is very involved in community and volunteer work, and loves to cook. Blake Bullock is the James Webb Space Telescope Campaign Lead for Northrop Grumman Aerospace Systems in Redondo Beach, CA. In this role, she is responsible for supporting scientific and technical advocacy for astronomy and astrophysics. Prior to her current assignment, Ms. Bullock served as Risk Manager and Systems Engineer for the James Webb Space Telescope Program at Northrop Grumman Aerospace Systems. Ms. Bullock served as a Presidential Management Fellow at the National Aeronautics and Space Administration (NASA) and in the Pentagon for the Office of the Secretary of Defense, Strategic and Space Programs. Prior to this, she lived and worked in New Mexico as a science journalist and Mass Media Fellow of the American Association for the Advancement of Science. She holds a Master’s degree in Astronomy from Wesleyan University and a Bachelor’s degree in Astrophysics from the University of California, Berkeley. She is a member of Women in Aerospace, the Association for Women in Science, and the American Astronomical Society. Northrop Grumman Corporation is a leading global security company providing innovative systems, products and solutions in aerospace, electronics, information systems, and technical services to government and commercial customers worldwide. Dr. Joel Green is an astrophysicist and Project Scientist in the Office of Public Outreach at the Space Telescope Science Institute, who are in command of the Hubble and upcoming James Webb Space Telescopes. Dr. Green studies the exchange between young stars and their birth clouds, in the form of infall (accretion disks, envelopes), and ejecta (outflows/jets). Dr Sarah Kendrew is a Belgian/British Astronomer and Instrument Scientist working for the European Space Agency in Baltimore, MD on instrumentation for the James Webb Space Telescope. She has worked on instruments for several of the largest international ground- and space-based observatories. Her research interests go from star formation in the Milky Way galaxy to the evolution of galaxies in the distant Universe.